The idea with A.I.SHA My Virtual Girlfriend has always been to have ‘Atrangi’ framing so it’s not just the characters that are emoting but also the camera. We go behind-the-scenes with director, Sahir Raza to find out more on the making of #AISHASeason2. Twice as dangerous. A.I.SHA My Virtual Girlfriend - Season 2 trailer out on Fri, Mar 9, 2017. Save the date. She's back and this time she's twice as dangerous. Watch the trailer. Twice as dangerous. A.I.SHA My Virtual Girlfriend - Season 2 Episode 1 out on Thursday, March 23, 2017. Save the date. Registered participants of the Cyber Security Summit can now audition to be cast in A.I.SHA My Virtual Girlfriend Season 3. Sign up here to be a part of the special auditions. We’ll see you at the audition booth! Here's a quick recap of A.I.SHA My Virtual Girlfriend - Season 1. Harman Singha teams up with Radio City, RJ Harshit and RJ Rohit Vir to play a prank on Raghu Ram. A few tips from Raghu Ram on how to be world ready. A.I.SHA My Virtual Girlfriend - Season 2	Who Is Maya? Introducing the new characters in A.I.SHA My Virtual Girlfriend Season2 - Faiz, Abigail and Professor Saraswat. A few tips from Harman Singha on how to be world ready. Here's the A.I.SHA My Virtual Girlfriend Season 2 theme song. 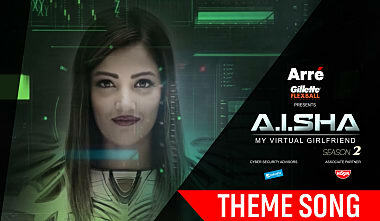 A.I.SHA My Virtual Girlfriend Season 1 and Season 2 streaming now on JioCinema. What went into the making of the various characters of A.I.SHA My Virtual Girlfriend Season 2? Watch to find out. Episode 4 streams on May 4. Watch Raghu tell you why you should binge on Season 2 of A.I.SHA My Virtual Girlfriend now.